It's a special Thursday edition. We watched Iron Man this past week. I'd always known of Iron Man the superhero, but for me he wasn't on par with many of the other popular characters who've been made into one or more movies. I just wasn't as into him. That said, this was an excellent introduction and overall movie. Robert Downey Jr. stars as Tony Stark, a free-wheeling egotistical technical genius who runs a weapons manufacturing company. After experiencing being held hostage and seeing his own weapons in use, he has a change of heart about his lifestyle and purpose, eventually creating his Iron Man suit. I don't want to give away too much of the plot otherwise, but again this was a solid intro that certainly left the door open for sequels, and that presented excellent discussion on the purposes and morality of war and defense. As it turns out on Entourage, Ari decided not to take the studio head position in a twist that I think is good for the series. Giving him such a position would have been too easy, and they went a much more creative way in bringing back the former #2 for the studio to take it instead. So Vince still gets the movie he wants, but in a way that keeps Ari as his agent. In addition, Jamie-Lynn Sigler had a cameo that 1) combined my two favorite HBO shows and 2) reminded me how great Sunday evenings used to be TV-wise. On a related note, we've both decided that we don't really like True Blood. I personally haven't been able to connect with or care about any of the characters. On yet another TV-related note, tomorrow evening is the live edition of Ghost Hunters that they've done the past few Halloweens. This time they're going to Fort Delaware, a prison used during the Civil War. Instead of having an ECW wrestler along this time, however, they'll have Amanda Tapping from Stargate. Meh. Coffeewife and I always enjoy these, even though it never seems like anything happens. And when it's getting so close to Halloween, you gotta watch The Great Pumpkin. It was on TV on Tuesday, but I had a meeting that ran long. So I got home just in time to watch Lucy wander out to the pumpkin patch and put her brother to bed. This was immediately followed by a second Charlie Brown special where Linus runs for student body president, which was okay for what it was. 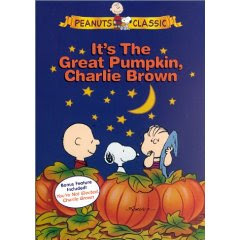 So I have yet to sit down and watch the second-greatest Peanuts cartoon ever created. I plan on doing that tonight. I've continued to enjoy Radiohead this week, as well as some Morphine. Around the web, in case you were looking for the t-shirt a few entries down, you can find it here.